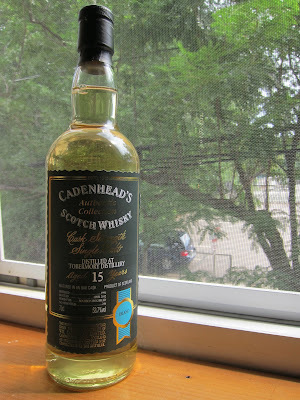 Cadenhead's Authentic Collection Tobermory 15yo (53.7%): A recent Cadenhead's bottling from Tobermory Distillery of Isle of Mull. It is distilled in 1996 and bottled in April 2012 which makes it 15 years old. Aged in an ex-bourbon hogshead that yielded 246 bottles bottled at cask strength. Many thanks to Teresa Hartmann choosing this expression for me and carrying it all the way from Edinburgh to Cambridge, MA. Color: Very pale hay color. That Hogshead must have been a second fill. Nose: Pretty sour and surprisingly sulphury if you think that the whisky haven't spend any time in a sherry cask... Not at a level of being repulsive (at least not for me) but it has definitely a good amount of spoilt milk, fresh camembert cheese and thousand year old egg aromas. Actually I remember getting these aromas from other Tobermory bottlings and from some European oak sherry cask finished Bruichladdich expressions before as well. A few drops of water open it up. I can nose now fruits like Medlar and persimmon fruit but the sourness is still there. Geuze beer, pickled garlic cloves, grandma's attic and smell of thick warm wool sweaters when you take them out of the closet at the end of summer. Palate: Salty and sweet at the same time like sea salt caramels. I do get some nutty notes simultaneously: roasted almonds and macadamia nuts. With water and time sweet notes takes over salty ones. Marzipan, almond croissants, Jordan almonds and marshmallows. I don't want to channel Jim Murray here but it is pretty sulphury. Finish: Long with a steady fade out. Sweet butter with subtle pepperiness. Overall: It would be a great typical example for an ex-bourbon cask aged non-peated islands whisky if the sulphur content wasn't taking over the joy. Nonetheless I have a feeling that I can develop a friendship with this bottle this winter if I can find a way to deal with these sulphury notes. We will try our best... Thanks again to Teresa Hartmann and Mark Davidson from Cadenhead's Edinburgh for helping her to choose this bottle for me.